This post originally appeared 10/1/18. We’ve bumped it today for the game’s release. Odyssey takes the franchise further back in history than ever before, following a mercenary in the Peloponnesian War, circa 430-400 BC. For the first time in the franchise, players can choose which protagonist they play as for the whole game: a man name Alexios or a woman named Kassandra. They hold the spear of the fallen Spartan king Leonidas and travel with their pet eagle, Ikaros, which earns them the nickname “Eagle Bearer.” After being forced to flee Sparta at a young age, they’ve made a new life as a small time misthios, a mixture of professional mercenary and low-level adventurer. While taking odd jobs on the remote island of Kephallonia, they’re tasked with assassinating a Spartan general. That job pulls them into the larger conflicts of ancient Greece and reveals the existence of a nefarious cult seeking to control the region’s politics. Over the course of a game that can run thorough players well over 75 hours and likely more, players will run along the shores of Greek islands, climb the buildings of Athens and Sparta, sneakily assassinate or brutally slay hordes of enemies and command a ship through naval combat on the high seas. These events are being viewed by a modern day character named Layla Hassan through a DNA-reading device called the Animus. Layla was introduced in last year’s Assassin’s Creed Origins, which had her primarily reliving the life of an ancient Egyptian assassin named Bayek. By the start of Odyssey she has aligned herself with the shadowy Assassin Brotherhood, which has clashed throughout history with Templar Order in a perpetual shadow war. Layla is using the Animus in hopes of finding artifacts belonging to the Isu, an extinct race of powerful precursors who ruled Earth before humanity. As with recent games in the franchise, this framing device is barely mentioned, at least initially. For dozens of hours, the notion that there’s an Animus and someone using it is divorced from the main story. Save for a couple of scenes, you’d be forgiven for thinking that Assassin’s Creed Odyssey has no connection to the games that came before. For many players, it could pass as the first entry in a new franchise. This is the most accessible an Assassin’s Creed game has ever been, and all it took was abandoning anything that remotely makes the game feel like previous titles. For some, this will be liberating. For others, it may seem like an attempt to cash in on modern design trends. What’s gained in accessibility and ease of play comes at the cost of sanding off the rough edges that gave the franchise much of its personality. At least, that’s how it initially seems. Assassin’s Creed Odyssey feels like a game trying to be the widely-praised 2015 role-playing game The Witcher 3: The Wild Hunt. It’s a process that started with last year’s Origins, which implemented more RPG elements and faster combat. Odyssey builds upon that to offer an ancient Greece full of side-quests, romanceable characters, and branching dialog trees. But while Odyssey recreates The Witcher 3’s gameplay form, it struggles in providing an equally engrossing story in the main campaign. Assassin’s Creed Odyssey’s narrative structures itself like a buffet, where players can pick and choose the series defining aspects that appeal to them the most and engage at their discretion. Fans drawn to Assassin’s Creed’s use of historical locations and personas can stick to the main quest, which focuses largely on the Eagle Bearer’s role in the Peloponnesian War. Those who wish to continue the higher-level experimental meta story of what’s happening in the modern day can focus on collecting First Civilization artifacts and furthering Layla’s personal narrative. And if you’re eager to understand the history of the Assassins and Templars, you can always hunt down the true identities of the Cult of Kosmos. While these narratives sometimes intersect, especially very late in the game, they’re mostly contained to their respective activities. As a result, Odyssey’s storytelling often feels fractured and lacking in confidence. Whereas early titles like Assassin’s Creed II wove its plot threads into one bold narrative, Odyssey allows the player to engage with them at their preference. While there’s an appeal to allowing that sort of player choice, it’s a instance where accommodating for the player ultimately weakens the game’s overall storytelling impact. It’s as if Odyssey is embarrassed to be an Assassin’s Creed game, leaving the more avant-garde or commentary-laden narrative frames on the periphery lest players have to engage with anything too challenging or outside of standard big-budget video game fare. "Man, Sokrates is a bit of a maláka.."
Stabbing Simulator... but everything's in dactylic hexameter. The game world is gorgeous, combat is brutal and expressive, great side-quests, mythological content is fantastic. Massive scale can be overwhelming, the main story lacks emotional bite, the best stuff is hidden away at the end of optional side-quests, occasionally glitchy. 75 hours thus far. Completed the main story in around 50 hours. Very close to 100%; mostly need to explore more shipwrecks. This is regrettable, because the franchise has always worked best when embracing these narrative frameworks, reassessing and re-viewing history through the self-aware lenses that Odyssey mostly discards. Assassin’s Creed III used (with mixed-success) a colonial American setting to explore the hypocrisy of the American Revolution, as well as craft a compelling story of a father and son on two sides of the Assassin-Templar conflict. Black Flag’s Caribbean buccaneering gave way to a character study in personal responsibility and faith. Odyssey never achieves such clarity of vision because its fractured structure robs it of the necessary focus. Odyssey wants to tell a story about family and Kassandra’s attempts to learn about what happened to them after she was forced to leave Sparta. But whereas Assassin’s Creed III gives ample screen time to its protagonist Connor and his Templar father, Haytham Kenway, Odyssey does not give its central relationships time to grow. Some of this is a result of how the game handles dialogue. Alexios and Kassandra never quite manage to feel like complete characters, as the game needs to realistically allow players and their avatars to carry out a broad range of potentially conflicting actions and personalities. You can be a mercenary who only loves gold, a vengeful warrior bent on revenge, or a level-headed mediator. While that works for side-quests, it never allows the character we’re playing to feel three dimensional in the main story sequences. I know who Ezio Auditore is. I know who Edward Kenway is. Those past Assassin’s Creed leads felt like fleshed-out characters. It’s much trickier to know who Kassandra is, even as I explicitly control how she behaves. Combined with a fast-moving script that only allows a few key scenes with major characters, the central narrative, while still featuring some strong moments, never matches the emotional richness of something like Assassin’s Creed II’s moody revenge tale or even the maligned Assassin’s Creed: Unity’s tragic romance. Odyssey might struggle in creating a broader narrative, but it soars in smaller moments. I’ve stood in front of crowds and debated rhetoric with Sokrates, who is as likable as he is annoyingly persistent with his questions. I’ve stood paralyzed with indecision in the aftermath of a battle, unsure if I could bring myself to assassinate my target upon learning their true identity. I’ve helped playwrights use their art to turn the populous against corrupt rulers. In these moments, Odyssey manages to deliver an engrossing portrait of a time and place where idealistic notions of governance and jurisprudence clashed with the stark realities of human ambition. These moments help drive the player forward in spite of a central character conflict that never really lands. Befitting its namesake, Odyssey’s best moments are off the beaten path. Odyssey’s side-quests, while never reaching the same sophistication as The Witcher 3’s, help counterbalance the main narrative’s inconsistent presentation by giving the player a chance to engage with the complexities of the setting and Grecian society. These are the moments where Odyssey can and does manage to explore topics such as sexuality, gender and justice. A quest with a sexually frustrated older woman can end with your character offering her some succor that helps reinvigorate her love-life. A quest to intercede on behalf of a woman on trial for sneaking into the Olympics places you on one side or another of Greek society’s attitudes toward women. Not every quest is so memorable. There are plenty of one-off cases where you’ll deliver bear pelts or fight off bandits. Most at least feature likable allies and even a few surprising twists that makes it worth talking to every new person you meet along your journey. It’s not a AAA game without a three branch skill tree. Thankfully, most of the unlock-able abilities are fun and genuinely useful as well. Your tasks will fall into one of two camps: open combat or stealth. The former builds upon Origins’ range-based hack and slack system to add powerful moves such as the ability to enter into a adrenaline rush mode or kick enemies back with an over-the-top Spartan Kick ala Zack Snyder’s 300. These abilities help augment combat in the face of new challenges—one skill allows you to pull the shields away from pesky defensive-minded foes—but it’s most satisfying to stick to the normal routine of dodging, parrying, and striking when there’s an opening. While I miss the cinematic flair and sense of control that the early titles’ instant-death parry attacks offered, Odyssey’s combat still creates plenty of exciting moments. It’s not the most refined. Sometimes, you’re just smacking buttons. But there’s still plenty of potential for self-made highlights. If you know what you’re doing, you can take on fiends much higher than your current level in duels where one false move spells death. In larger fights, you’ll swap from target to target and wait until key moments to dash forward and shove clumsier enemies off cliffs. When the need for sneakier solutions arises, Odyssey can really shine. Sneaking through an enemy fortress is a satisfying puzzle, and the player has many different tools at their disposal. The series’ free-climbing mechanic makes it easy to ascend to rooftops and use verticality to your advantage, setting you up for stealthy bow-and-arrow headshots or dramatic aerial assassinations. What really makes Odyssey’s stealth work are the unlockable abilities. These might feel too video gamey and against the spirit of older Assassin’s Creeds for some players, but they make it possible to achieve remarkable feats. One stand-out ability allows Kassandra to throw her spear and near-instantly move to the hapless enemy’s position for a quick execution. Higher levels allow the ability to be chained, making it possible to blaze a gory path through encampments without raising an alarm. Other abilities grant sudden camouflage or new assassination moves that can dispose of tougher targets. You don’t need these skills to succeed but they create an intoxicating gameplay possibility space. 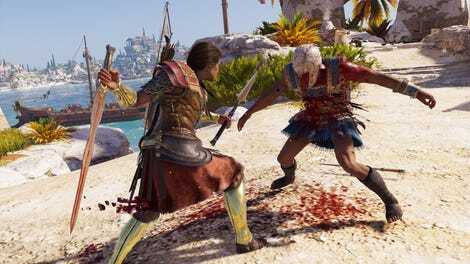 Kassandra (or Alexios) and the player blur the line between skilled mercenary and demi-god, and experimenting with the game’s numerous abilities helps stealth shine. An extensive roster of mercenaries wanders the world, sometimes hunting you down. Defeating them increases your personal reputation and grants access to quality loot. It’s not too deep, but can lead to dramatic confrontations. Odyssey speaks loudest through its various systems, a layer-cake of factional control mechanics and personal glory metrics that help convey the tensions that tore the Delian League apart. Chief among these is a nation conquest system where the two sides of the Peloponnesian War—Sparta or Athens—can claim control of any of the game’s regions. Players can upset the balance of a nation by defeating soldiers, stealing loot from forts, burnings supplies, and other actions. These affect a nation’s overall strength, which can trigger climactic battles where the player can fight for either faction. Alternatively, they can weaken a nation by locating and assassinating its leader, whose general level of protection is also affected by the player’s acts of sabotage. This strange cycle of factional violence and high profile assassination proceeds seemingly without end. Like the forever wars of Metal Gear Solid V: The Phantom Pain, it paints an unflattering picture. Assassin’s Creed has always viewed human history as little more than the application of violence either grand or subtle. Odyssey’s nation conquest system goes the extra step and layers that sentiment over its massive game world. The world is beautiful, but it will always be at war. Odyssey’s emphasis on conflict and martial power applies on a personal level as well. In Assassin’s Creed: Origins, players could hunt and defeat the Phylakes, roaming bounty hunters tasked with killing the protagonist Bayek. Odyssey does something similar, populating the world with mercenaries that track and confront the player if they gain notoriety. It lifts heavily from Shadow of Mordor’s Nemesis System, dynamically filling the world with esteemed warriors. The player’s relative ranking among these mercenaries is tracked, allowing them to gain prestige and valuable loot by defeating would-be warrior heroes throughout their adventure. Not only does this help the player better inhabit their character’s role as a misthios but it helps facilitate some of the game’s most exciting moments. I’ve had tenacious mercenaries hunt me down on the open seas for climactic battles among roaring waves, and I’ve been cornered by some of the world’s deadliest warriors after accidentally assassinating a king during a fortress assault. To survive in Odyssey means constantly testing your prowess in a world where there’s always someone else eager to end your legend. These systems frame a game world of genuine beauty. Assassin’s Creed Odyssey uses color more intelligently than any game in recent memory, imbuing its world with a mixture of earthy tones punctuated by pastel pink leaves and golden sunbeams. Fields of corn stretch over windswept meadows, while aquamarine water laps sanded coastlines. The world encompasses locations as dire as death-billowing volcanoes and sterile marble quarries. It has thriving metropoles packed with open theaters and glittering gold statues. Every inch is coated in some of the finest sunlight ever put into a video game, an angelic diffusion of such radiance that it feels like an ancient secret. Odyssey exists in the grey area between reality, memory, and legend. No matter where you are, the world brims with unparalleled artistry. This merger of lush world design and evocative systems helps define the Odyssey version of Greece as both the idyllic vision we sometimes still chase after and something hard and unforgiving, where verdant fields are all too often drenched in blood. It creates a remarkable sense of place. It is both the stuff of storybooks and somewhere unrepentantly real. The crest of each new hill holds countless possibilities, and players will likely eagerly press forward to see what other wonders Greece can hold. More than anything else, this is Odyssey’s crowning achievement. The world is inviting, mysterious, and every single inch worth exploring. Odyssey is nevertheless terrifying in its scope. One or two of its lush nation states could host an entire RPG’s worth of quest-givers and collectables. There are 36 regions, either mainland city-states or island territories, all of them brimming with forts to conquer, characters to meet, leaders to assassinate, historical sites to visit, treasures to loot and beasts to slay. These activities are integrated into a tangled web of meta-game systems and managerial tasks. There are all those leaders to overthrow, those mercenaries to confront, those cultists to track down and so much more. Each of the activities gives context and flavor to the world, but there was a downside. While I enjoyed my time engaging with Odyssey’s rich gameplay tapestry, I also came to the bitter realization that it was too big. That isn’t to say that I thought there was too much stuff to track or that there was too much meaningless busywork. Every time I embarked on a multi-step quest to dispose of a deadly branch of cultists or set out to destabilize a nation, the process has been engrossing and enjoyable. The problem is that there is so much to do, in a world of such scale, that I can’t help but conclude that this type of design is not sustainable. We don’t know what the work conditions were for the developers making this game, but I’ve heard too many horror stories from and about developers working on ever larger games and enduring painful crunch in the process, that I often find myself worrying about the people who make huge games. I worry about the people who will make future games at any studio that try to top the likes of Odyssey in scale or detail. Odyssey is gorgeous and I love playing it but I’m left wondering exactly what the human cost was for my enjoyment. While I adored the majesty of Odyssey’s world, I was often uncomfortable participating in it. I contacted Ubisoft during this review to ask about the game’s labor conditions during development but did not receive reply in time for publication. This scale also leaves the door open for bugs and glitches that while usually amounting to little more than framerate dips and odd enemy AI, can sometimes create more dire problems. Most memorably, I almost found myself completely unable to progress after I managed to skip the trigger volume to a cutscene with a key character. That trigger presumably set a flag indicating that the NPC was in the same city as me and available for their next scene. But because I skipped it, I found myself tasked with locating a character halfway around the world all while the game would not let me exit the current city for story purposes. Were it not thanks to one of the game’s numerous auto saves and some luck, I would have been stuck in Athens searching fruitlessly for someone on the other side of an impassable barrier. My colleagues who also played review copies of the game experienced rare but noteworthy crashes. The auto-save system saved them each time. Multiple times while writing this review, I literally yelled in frustration as I tried to sort out my thoughts about this game. Odyssey’s moment to moment gameplay is incredibly fun. Exploring the world always leads to new and worthwhile experiences: finding a lost treasure in flooded temple ruins, surviving waves of enemies in the arena and taking down another champion, tracking a conspirator to their home and assassinating them in their sleep. A detour to help a child find their father builds until you’re lost in the Minotaur’s labyrinth. A plot to end cultist influence over an order of priestesses leads to a deductive puzzle to identify and dispose of the the traitor, or else mete out misplaced justice on the wrong culprit. It’s the sort of wild and exciting road trip through ancient Greece that I always wanted in a video game. Taken on those terms, Odyssey isn’t just a good game but a great one. This open world romp comes paired with decisions that are disappointing, marking an erosion of identity and vision that’s grinds Assassin’s Creed into something unrecognizable from the first half-dozen games in the franchise. Some people might appreciate that, but I think those games were more daring than we often acknowledge. This was a series that used a meta-commentary frame to comment on its own design. It painted surprisingly human portraits of both heroes and villains. It was a series where George Washington was shown to be as villainous and flawed as any Templar, where Ezio Auditore grew from hotheaded lothario to wizened master assassin thanks to careful character writing. When the time came for tie-in DLC for Black Flag, Ubisoft opted to tell a story of Haitian liberation and use its mechanics to explore the blackness of its protagonist. When they imagined what Templars and their allies would look like in the 21st century, they gave us a bunch of latte sipping project managers and Supreme Court judges. Odyssey’s eagerness to please everyone has created a world worth exploring but it comes at the cost of a clear vision. I can’t entirely tell what Assassin’s Creed is anymore, other than a name on the package meant to help sell a product. And then there’s the final quarter of the game, an immensely impressive and largely optional chunk of content that is drenched in Assassin’s Creed tropes. The game’s most Assassin’s Creed qualities, it turns out, are tucked into an ending many players won’t experience. Odyssey’s narrative structure perplexingly leaves its most shocking and thematically interesting plot threads as skippable side content. Halfway through the game, the player is able to hunt for First Civilization artifacts for the purpose of sealing away a great power from conspirators who would misuse it. Collecting the required plot items involves coming face to face with the source of numerous Greek myths such as the Medusa who has been shown off in pre-release demos. Each of those magical encounters provides challenging boss fights and spectacular glimpses into the franchise’s greater cosmology. The ramifications of Kassandra’s journey intersect with Layla’s in a major way, culminating in a moment that fully embraces the speculative fiction qualities the franchise has recently seemed so eager to leave behind. This plotline is so essential to completing the game’s story, both thematically and in terms of raw narrative, that making it optional stands out as the game’s most misguided decision. It is so damn good, and a more confident game—one less afraid of its lineage—would have placed it front and center.